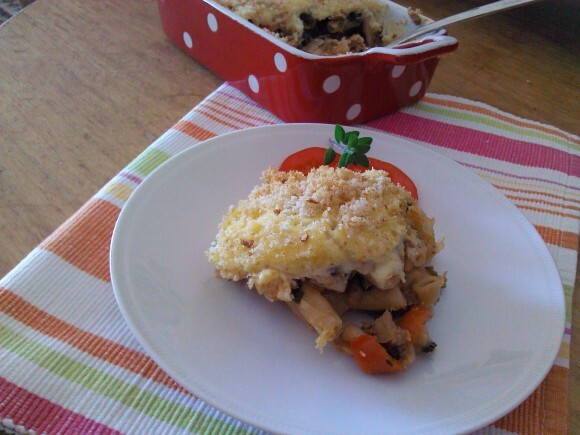 This economical spinach and pasta bake may seem simple, but it is extremely tasty. It is the kind of dish that will easily become a family favourite. It might even convert veggie haters into firm believers! Popeye, eat your heart out! Heat the oil in a heavy bottomed pot and fry the onions, garlic and peppers over moderate heat until the onions turns soft and translucent. Add the mince and stir with a wooden spoon to break up the clusters. Fry until the meat changes colour. Add the spinach and mix well with the other ingredients. Add the tomatoes with their juice. Add the seasoning, herbs and nutmeg. Lower the heat, cover the pot and simmer for about 15 minutes. Add the cooked macaroni to the mixture and mix well. Transfer the mixture to an ovenproof baking dish. In the meantime, melt the butter in a saucepan over moderate heat and stir in the flour. Take it off the heat and stir in the warm milk a little at a time to make a smooth sauce. Put it back on a low heat and cook, while stirring, until the sauce thickens. Take it off the heat and quickly stir in the beaten egg. Top the meat mixture with the sauce and sprinkle with the breadcrumbs. Dot with the butter and bake in a preheated oven of 200ºC for 30 minutes.